Don't miss out. There's only 4 available and 8 other people have this in their cart right now. Don't miss out. There's only 1 available, and 8 other people have this in their cart right now. 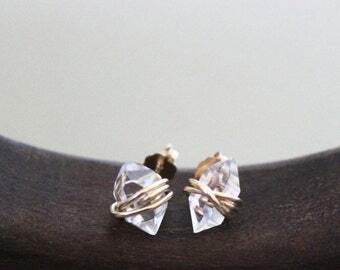 A pair of Herkimer Diamond stones securely wrapped in 14K gold fill wire, sterling silver or 14K rose gold fill wire. These earrings are also available upon request in solid 14K gold, rose gold and white gold. 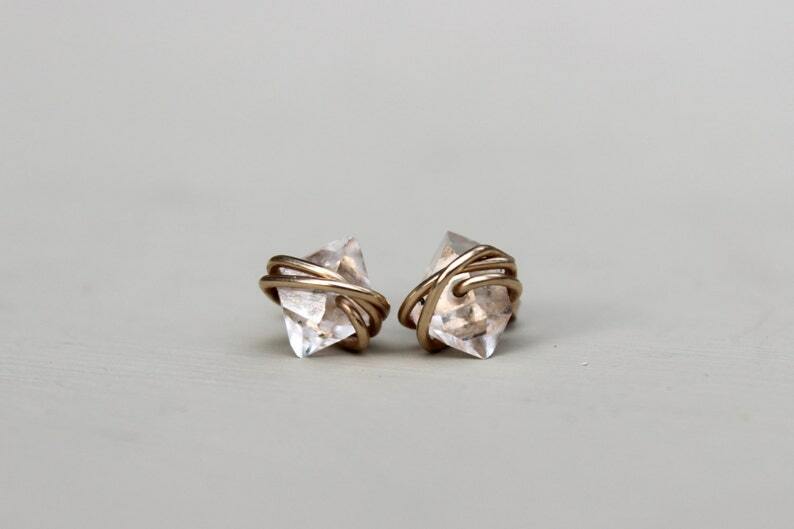 These Herkimer Diamond earrings are perfect addition to any outfit! The stones are approximately 7-9mm. Due to the natural variation in Herkiemer diamonds, each stone will be slightly different and no two stones are the same. Your item will be sent in a blue box with a silver ribbon. These earrings are just as the photo looked. They came in time for me to give to my 17 year old to granddaughter. She lived them which is the most important thing! Arrived in time for them to be gifted for Yule, and they look very nice. My spouse is most pleased with them, and I would definitely recommend them for anyone that wants diamonds on their ears! If you don't see something you're looking for, I'd be happy to work with you to create the perfect piece. Please make a custom request and I will do my best to accommodate you! Necklace length: Most necklaces pictured are 16" long, 18" typically hits slightly below the collar bone and 14"-15" for chokers. I currently take wholesale orders on a case by case basis. If you are interested in placing a wholesale order, please send me a message. If you'd like a personalized note to be sent with your package, please leave it in the 'Note to Seller'. Your order will ship no later than 5 business days after it is placed. Designed By Lei is not responsible for any delays, losses or damages due to shipping. Please contact the USPS if you encounter an issue such as this. I will not 'guarantee' that any package will be delivered by any specific date. The USPS dates are guidelines and are NOT guarantees.